Next stop Charing Hot Cross Bun. The cooks and even the non cooks amongst you may know that yesterday saw the launch of National Baking Week to celebrate the UK's love of baking. The launch event in London was genius as bunch of cooks went into St Pancras station and made a London Underground Map out of cake (what's not to like about that?). I love the bakery & cake puns on the Tube station names. So above we have Imperial Mint Wharf Cake, But there was also Charing Hot Cross Bun, Victoria Sponge, Wimbledon Parkin, White Chocolate Cheesecake Chapel, Puddington, Swiss Roll Cottage and the more recipe orientated - add 250ml Waterloo. London landmarks such as Marble Arch, The London Eye, Tate Modern and Big Ben were also made out of cake and placed on the Tube Map. As a number of you know, I'm an enthusiastic cook and in addition to running Nom Nom Nom, the charity MasterChef contest for bloggers, for the last four years, a few months ago I became Head of Social Media for Great British Chefs (yes, I get paid to eat, cook, talk, blog & Tweet about food - there's worse jobs). Each day, for National Baking Week, we're focussing on some baking goodness on our Facebook page. So I really love this map. 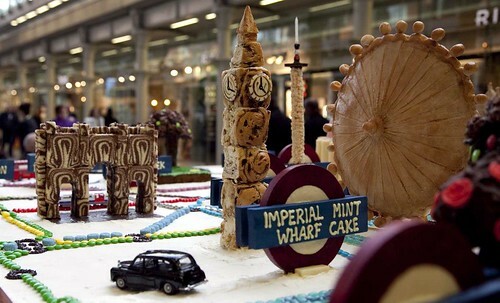 Kudos to the guys and girls at National Baking Week, they've certainly put the event on the (Tube) map in my eyes. Any other Tube Station Cake or Baking puns you think they could have considered for the map? UPDATE - Just discovered through the comments after TRT had suggested Manor House Cake (BTW thanks to all for your great suggestions) that TfL actually have worked with Mr Kipling to make some Tube Station name cakes to cover some stops on the Piccadilly Line. Smoke magazine (the very irregular but amazing London "fanzine") covered this back in Issue 8 and its co-founder Matt Haynes kindly sent the following screengrab of the piece. Love it!